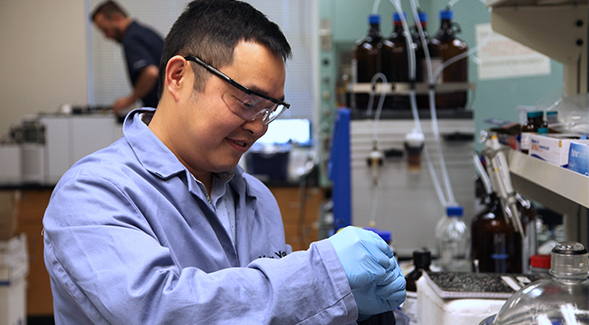 The NSF funds chemistry professor Yong Yan’s groundbreaking work on drug synthesis. A San Diego State University chemistry professor has made a discovery that could one day lower the cost of hundreds of prescription medications. Yong Yan and his team of student researchers have discovered that a hybrid material, perovskite, can be used as a catalyst to spur the chemical reactions necessary to make pharmaceutical drugs. The material, previously used primarily for solar power cells, is exponentially cheaper and more efficient than other catalysts used in drug synthesis. Yan’s research is funded by a three-year, $390,000 National Science Foundation (NSF) grant. The Journal of the American Chemical Society recently published Yan’s findings, which were also included in Chemical & Engineering News magazine. Yan discussed his research, and its potential impact, in a recent interview with SDSU NewsCenter. Q: What are catalysts and how are they essential to making pharmaceutical drugs? The synthesis of pharmaceutical drugs involves the critical bond formations of elements, such as carbon, nitrogen and oxygen. Many of the organic chemical reactions required to make drugs cannot happen without the assistance of catalysts. I work specifically on photocatalysts, which are materials that absorb light and spur chemical reactions. I study how photocatalysts induce bond formations between carbon atoms, one of the most fundamental chemical reactions in the world. Catalysts mitigate the intensity of these chemical reactions—which manifest as high temperature and high pressure—that would adversely affect a drug’s potency. Instead, they allow drug-synthesis reactions to occur in a mild and peaceful environment, one that is essential to creating effective but chemically complex pharmaceuticals. Q: Why, traditionally, are photocatalysts so difficult and expensive to make? Photocatalysts are made using extremely expensive metals, such as iridium, ruthenium, rhodium, platinum, and palladium. Not only can these materials cost several hundred dollars per gram or more, they are also incredibly sensitive and require costly infrastructure —such as oxygen-free environments— that make the process of creating pharmaceuticals even more expensive. Q: How is it that perovskite can be used as a cheaper and more sustainable catalyst? I discovered that perovskite, an inexpensive hybrid material with an organic and inorganic framework, can be used as a photocatalyst. Perovskitehas primarily been used in solar cells to generate renewable energy. My lab has found another use for the material. It is much more efficient and affordable than most existing photocatalysts. For example, iridium, a commonly used photocatalyst, costs $2,000 a gram, and one unit of iridium facilitates 100 chemical reactions. Meanwhile, perovskite costs $4 a gram, and one unit results in 52,000 reactions. Q: How might this discovery fundamentally change or impact the pharmaceutical industry? Perovskite has already become one of the most researched and promising materials in the solar cell industry, particularly because it is extremely efficient, affordable and easy to process. My research leverages this technology and knowledge from solar cell industry, and directly applies it to drug synthesis. This could greatly reduce the cost of making thousands of different pharmaceuticals, a reduction that could one day be passed on to consumers. My lab’s research has also found that certain chemical bond formations once thought impossible might actually be possible with the use of perovskite. This could lead to new methods of creating drugs, a possibility I am researching with support from the NSF and the U.S. Department of Energy. Q: When did you come to SDSU and what do you enjoy most about being a professor here? I came to SDSU from the New Jersey Institute of Technology as an assistant professor in 2018. I love that I get to work with students who have real research potential. I see students who come in with no sense of research, and then gradually they learn how to use critical thinking and advance a project to its next step. That is exactly how education should work. Several of my students were critical to completing this research, including graduate students Yixiong Lin and Yue Sun, senior Jovan San Martin, and post-doctoral researcher Xiaolin Zhu.